I have been testing the Grandstream GXV3140 Multimedia IP Phone for a few days now and thought I would share the experience with Video Conferencing with it. When I first received this phone, I was curious about its multimedia features but I was definitely interested in getting it to work with my Asterisk IP PBX system in the office. I wanted to test the GXV3140’s video capability and interaction with other video phones or softphones. The ultimate goal was to use this IP Phone for my Medical Office clients enabling doctors and nurses to communicate more effectively. I wanted a system that was simple to set up, had a color screen, nice video capability and inexpensive. In the office, I have an Asterisk IP PBX Server running CentOS, Asterisk 1.8, and TFTP for provisioning. The network is a no frills Gigabit ethernet network with a Cisco Small Business PoE switch. The GXV3140 will be connecting to a laptop running Counterpath’s Bria softphone via UniFi wireless network. 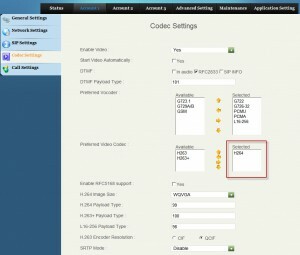 Asterisk’s sip.conf file must be edited to allow video and enable video codecs. Now that the video is enabled on Asterisk, the phone must have matching video codecs. 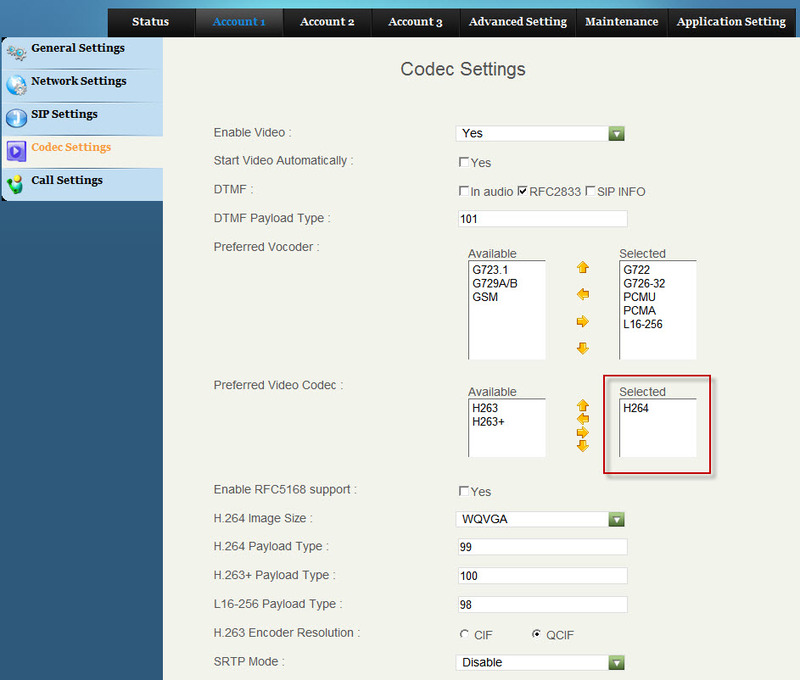 Under the Account, on the Codecs submenu, make sure you enable the same Video Codec. I found out that all available codecs are supported by both Asterisk and the GXV3140. However, the video quality was best when using H264 code exclusively. Also, make sure the Enable RFC5168 support is Unchecked and select the H.264 image size. WQVGA is the best resolution out of the bunch at 400X240 pixels. As for the softphone, it was easy to configure for video. Just make sure the same codecs are enabled in the Properties. When making video calls to/from GXV3140 and Bria, the video quality was surprisingly good as long as your location is brightly lit. It would have been absolutely wonderful if the built in camera was HD but it would have done little on such a small LCD screen. I only noticed it because Bria was running on my laptop which had the Video window maximized. If the test was from a GXV3140 to another GXV3140, I don’t think I will have wanted a better resolution camera. Overall, for the price, I have no complaints and I cannot wait to showcase this to my clients. They are going to absolutely love it. NOTE: We are practically giving away the Grandstream GXV3140 through our webstore: VoIP Phones Direct. They are currently on SALE at the time of writing this article for $159.95 which includes FREE UPS Ground Shipping.